Zak and I have always found that people overuse teething as an excuse to explain baby behavior. As soon as a baby is fussy or crabby, it seems to get explained by “I think he’s teething”. Some babies I know have seemingly been teething from birth to about age 2. But a friend of mine explained to me recently why teething is such a practical excuse: it carries no parental guilt. If your baby is tired, it usually means you didn’t put him to bed on time or haven’t found a schedule that allows her to sleep properly. If your baby is hungry, it might mean you didn’t feed them enough or, even worse, that you don’t produce enough milk. If your baby is sick, you might wonder if you should take them to the doctor or give them pain medication. But it your baby is teething, there is really nothing to do. It’s not your fault. And therefore it makes you feel less bad about their behavior or their possible pain. It has therefore been the running gag between us with our baby girl. Whenever she was fussy, we would exclaim that she must be teething. We have said that phrase over and over again, but she still didn’t have any teeth. Yesterday was one of these days when she seemed to go from eating happily to holding her head and crying. So we joked about it. And guess what? In the afternoon, I happened to have my finger in her mouth (sounds strange, but it happens a lot with babies. This time I was removing something she had put in her mouth that wasn’t part of the 4 food groups) and I felt a tooth! Zak verified, because he wasn’t sure he believed me… and it was true. There is a tooth piercing that gum! Whether or not it has anything to do with her behavior is still debatable. But there is definitely a tooth! At 9 months, it was about time! Bring on the food! I love my son. He’s funny and spunky and so incredibly smart. He has this amazing imagination and can make up stories about anything. He is also incredibly frustrating when he does really stupid things without realizing their consequences or when he has meltdowns at the worst times, but eh, he’s not quite four yet. And in general, he’s a really good kid. Lately I have seen emerge the big brother in him, and I love it even more! Sure there is still the occasional bump along the road, like yesterday when he threw a book at his sister’s head. Granted, it was a fabric book about 2 inches square. It didn’t hurt her. Still, he was scolded for that one. But I digress. What I wanted to focus on is the emergence of play between the two siblings. Some is annoying. Like when the big brother goofs at the dinner table to make his little sister giggle. It works, but then neither of them is eating and meals are already dragging on enough as it is. But you know how it is when you’re almost four and you discover that you have a very good public ready to laugh at your every funny expression. And most of it is really funny. Like when we go out the three of us with the baby in the stroller, my son will run ahead 50 meters, then turn around so he’s facing the upcoming stroller and make faces at the baby until I pretend I will crash on him. When we’re stopped at a grocery store, while I’m considering the respective virtues of two different brands of canned corn, my son is usually lying halfway in the stroller, on top of the baby, giving her hugs or tickling her. I’m always afraid he’s going to hurt her, but she’s always giggling. So I let him be. It makes strolling the baby easier. The other day I turned around while in the bedroom to see my baby on her belly on the floor and my son, holding her by the back of her sleeper, dragging her back and forth. I was just about to scold him when I realized that the baby was laughing her head off. So I laughed, too. It’s nice to see the beginning of a healthy sibling relationship form. I’m sure they’ll want to kill each other more than once. But right now they hug and giggle. And I love it! I have been very quiet lately, mostly because we have been traveling. We had planned a very busy summer before we knew we were going to move, so that became the crazy factor that rendered all traveling plans crazier. But we were committed. So we went to Quebec for almost three weeks to visit my family and had a great time (I especially love seeing my kids interact with their cousins). Then we were back for a week of frantic unpacking (which included two trips to ikea, putting up six different pieces of furniture, and taking all of our food out of our boxes). Then we hit the road again, this time bound for Kelowna where Zak’s family has a small orchard. My son had an amazing time there helping around the property. He found some working gloves that were almost not double the size of his hands and picked up some wood, helped his grandmother garden, helped thin the apple and pear crop and ate way too many marshmallows by the campfire. But now we’re back home, which means back to unpacking mode. Or at least trying to make sense of our space or what little is left of it. In the meantime, my baby has grown like crazy. Not in size, mind you, but in abilities. She is definitely walking around holding on to furniture now, and she’s getting more sturdy on her feet. She started waving bye-bye a couple weeks ago, but now she obviously understands what the words bye-bye mean as she will wave when we ask her to. She is lightning fast when crawling, and she’s starting to play more games like peek-a-boo. 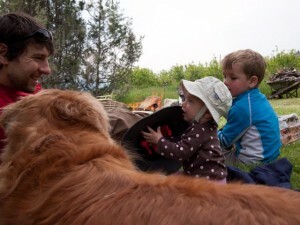 When I was blowing up my son’s camping mat in Kelowna, she crawled to it and lied down on it, as to pretend she was sleeping. She is shy with strangers but quickly warms up, and she is quite simply a cutie pie. Here is a photo of the family that could have been: Zak, the kids and Sherpa, the dog we had to give to my in-laws because he was too nervous around our son. Well, he’s just the same with the baby: she loved him to bits and always crawled to him, but he hated to be the object of that attention and ended up growling at her a few times. He’s definitely not to be trusted around the kids, although he’s doing much better around our son now that he can throw balls.